Fellow Subaru admirers, I'm drooling. 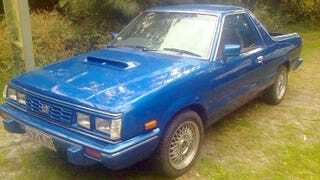 Some guy thought that it would be a good idea — and it is — to drop one of Subaru's turbocharged WRX STI engines into this little ol' BRAT. With that kind of power, there won't be many Kangaroos who can outrun it. New, this '93 second generation BRAT cranked out a miserly 73 hp. But since it only weighed 1,700 pounds, is had enough power to get out of its own way, if only by a hair. Now how about stripping out the original anemic mill and stuffing a new STI engine in there? With nearly 300 hp, that means ... well, a stupid amount of power for such a tiny car. Just watch it in a drag race. Sure, it loses to a car with a larger engine, but that takeoff! This makes me wonder if maybe I should do something similar with my '86 Subaru GL wagon. Anyone have an STI engine they don't want?